Norman Rockwell gave this and another painting to the Berkshire Museum. Violating ethical guidelines for museums they and 38 works will be sold for renovations and endowment. The initial response for plans to “reboot” the 114-year-old, eclectic Berkshire Museum was met with enthusiasm from the community and business leaders. There was the welcome notion of a refocused mandate with a concentration on history and science. To reach this goal 40 works, including two donated to the museum by Stockbridge based artist Norman Rockwell, would be sold. Initially, Van Shields, director of the museum backed by the board, was sketchy and evasive about the remaining 38 works. When I attempted to post a letter to the Berkshire Eagle quoting the ethical guidelines regarding museum deaccessions, as published by the Association of American Museum Directors, there was immediate pressure from the museum. The letter was briefly posted then pulled from the Friday Eagle website. It was scheduled to run in the Sunday paper. The argument of the museum to the editors was quite simple. It stated that Shields was not a member of AAMD and that secondly, and most significantly, he was not running an art museum. Accordingly, he was not bound by the ethical guidelines of the museum field. The editor I dealt with invited me to submit a revised letter which they published with one minor edit. What had been told to the Eagle, and conveyed to me, was not publicly stated by Shields and the museum. If you say that you are not an art museum, and redefined your identity and mandate, that raises obvious questions which the museum was reluctant to answer. There was an interview by the Berkshire Eagle of Norman Rockwell Museum director, Laurie Norton Moffatt, and a strong op-ed piece by her. That provoked digging deep into consequences of the decisions and reporting on the story changed. It attracted national attention including a critical broadside from the top-ranked, New York based, arts blog, Culture Girl. Eagle reporter Carrie Saldo has filed several reports including coverage of the full list which was released today. The museum’s website now has a platform devoted to “frequently asked questions” about the sale “reboot” and fate of the collections. This paints a very different picture than what the museum initiated and how it expected to be perceived. With backtracking and face saving it now states that art will indeed be a part of its future plan and that it will continue to exhibit and acquire. Note that of those consulted there are no artists or arts professionals. In pursuing this story none of the artists or art world leaders I contacted had prior knowledge of this “two-year planning process.” The more common statements were attempts to contact and interact with Shields with little or no response. This includes individuals who were actively involved with the museum under its popular, prior director, Stuart Chase. What follows is the list of 40 works to be sold by Sotheby’s this fall. The big ticket items, sure to sell in the millions, are the two paintings by Rockwell which Norton Moffatt has identified as masterpieces. When the museum stonewalled what it intended to sell there was speculation by those familiar with the collection. There were concerns expressed about works by leading contemporary artists with Berkshire roots, Gregory Crewdson and Stephen Hannock. Pittsfield has been used as a locale for Crewdson’s large format, staged photographs. A Hannock work, from the Newcastle series he showed at the museum, was given in the name of philanthropist, Nancy Jane Fitzpatrick. For now at least those high end contemporary works have been spared the auction block. There are, however, deep cuts into the museum’s renowned holdings in American art and Hudson River painters. Some will be readily familiar to visitors while other works are obscure. The press release does not include dimensions and no images have been made available to the media. Cutting into flesh and bone are key works by landscape artists, Albert Bierstadt, Ralph Albert Blakelock, Frederick Edwin Church, George Inness, and Thomas Moran. George Henry Durrie painted populist scenes converted into lithographs by Currier and Ives. There is a lost opportunity to integrate these paintings with displays of geology, botany and natural history. From the 18th and 19th century are important works by Benjamin West, father and son Charles Willson Peale and Rembrandt Peale, the visionary artist John LaFarge, and impressionist, Thomas Wilmer Dewing. There is a nice Diana sculpture by Augustus Saint-Gaudens. You may recall his Robert Gould Shaw Memorial opposite the State House on Beacon Hill. It inspired the film “Glory.” There is a bit of history now gone forever. Then there are the two Calders, good grief, the Calders. There are Dutch Masters, French salon artists and examples of impressionism, fauve and modernism that clearly are outside the mission statement. Adding to that are odd items of Chinese and Japanese art. These latter works are the kinds of non sequiturs that watchful curators could and should have weeded out long ago. If you follow ethical protocols this is the normal process of selling non essential works to thin out and upgrade collections. It is usual for museums to bundle minor works to pursue major ones. This is no different, for example, than a baseball team looking for pitching or a basketball team pursuing a point guard. As they in sports, however, sometimes the best trades are the ones you don’t make. In the Eagle Saldo reported that “Former Berkshire Museum Director Laura Bragg, who retired in 1939, sold several pieces of art during her tenure. "Raftsmen Playing Cards" a painting by 19th century frontier artist George Caleb Bingham, was sold under Bragg's leadership in 1934. By the late 1970s there was a resurgence of interest in Bingham and the artwork, which the Berkshire Museum sold for a few thousand dollars, was valued to be in the six figures, an Aug. 12, 1978 Eagle report stated. What will we be saying about the Rockwells? Right now the money serves as a band-aid. The facts faced by the museum are daunting. Over the past 10 years, the museum's structural deficit, including depreciation, has averaged $1.15 million each year. Given how poorly thought out and executed the makeover has been planned and launched you have to wonder about the role of leadership and vision. Cherry picking and selling works from the collection never works. List of works to be sold. "So interesting, Charles. Is it possible that other concepts can apply? 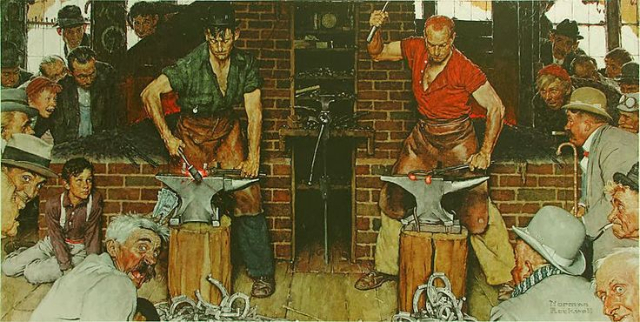 For instance, Rockwell is first and foremost a Berkshires' artist. I knew him a bit. He married my high school English teacher. They travelled, but Stockbridge was always the home to which they returned. Calder of course lived in Roxbury. Visiting the Crystal Bridge Museum in Bentonville, Arkansas, you realize how hungry other parts of the country are for American art. Yet when the Thomas Jefferson Medical School de-acesssioned the Gross clinic by Thomas Eakins, and Crystal Bridges bought it, the city of Philadelphia was allowed to purchase it back at cost and now the Philadelphia Art Museum and the Pennsylvania Academy share viewing privileges for this important painting by the city's most famous artist." "I still think that it is the scepter of MassMoCa that is motivating this decision. I mentioned the word "interactive" that the director of The Berkshire Museum used and I think this is the way of the future in Museum's. I have read in other venues that the millennials are so "over it" when it comes to the tradition. In the middle of this essay I write about interactive at MassMoCA http://martinmugar.blogspot.com/2017/07/paul-rodgers-modern-aesthetic.html"